Homeschooling with 5 kids is not always the easiest thing to do! Having a 4yo and 2yo makes it even more interesting. So when I learned about Busy Bags, I got super excited! 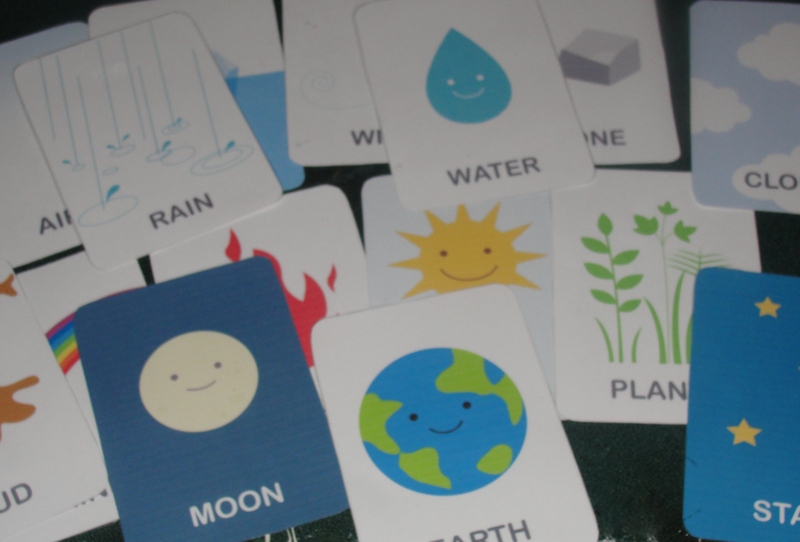 What a great way to keep my 2 little ones entertained while learning at the same time. So I set out to create as many bags as possible. I searched Pinterest and bought the Preschool Activities book. So far, I have about 2 laundry baskets full of bags. (I have a tendency to become fanatical about things). 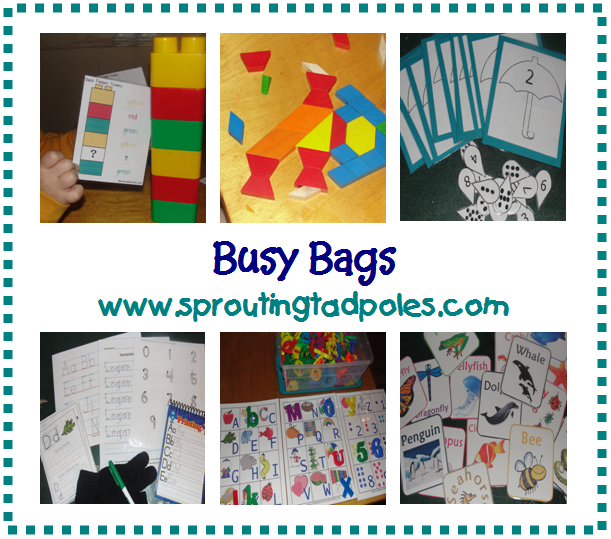 Busy Bags are a great way for me to keep the little ones quiet while I school the older two. I pull out the basket and there are enough activities to keep them busy for at least 10 minutes! Seriously though, they play for about 45 minutes – an hour before moving onto something else. that’s enough time for me to get the older two boys started on their morning work. So here are a few of our Busy Bags. I will add more as I get pictures of them. If you want more ideas, subscribe to my blog and watch your inbox! Animal Cards – These Free Printable Animal Cards are one of my first creations! My 2 yo loves to look at these and calls them all “doggie”. 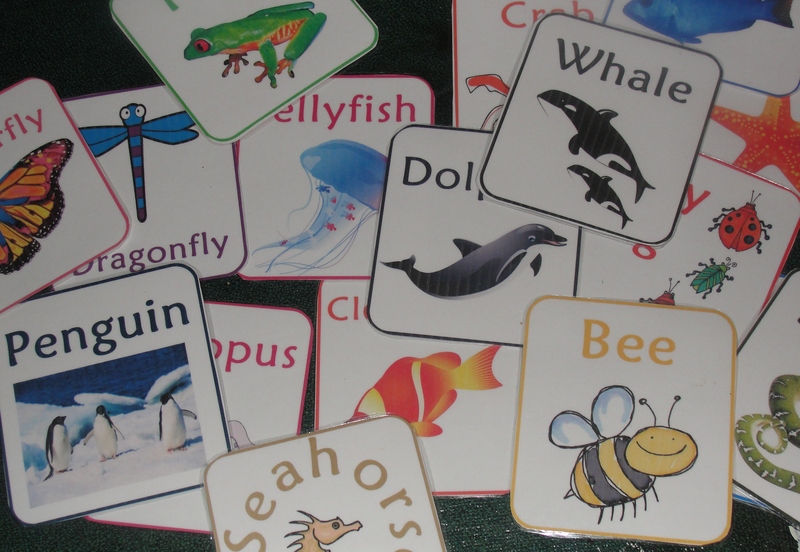 My 4 yo can identify them by name and we work on separating into groups – ocean, farm, zoo, insects, etc. 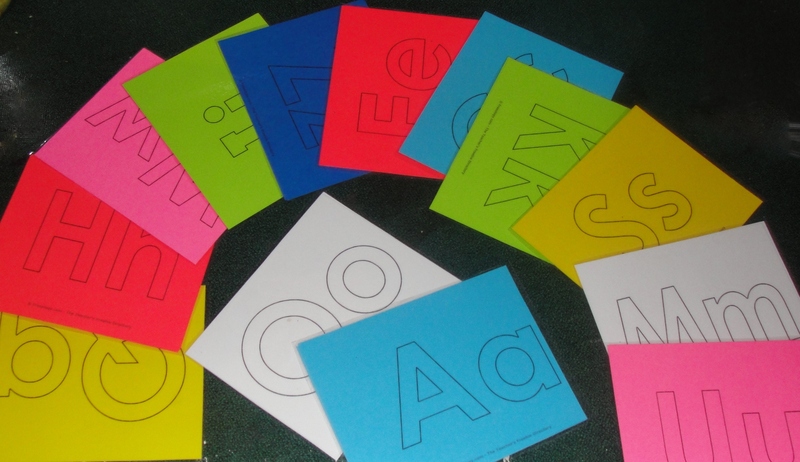 Alphabet Cards – I set these to 4-to-a-page on my printer, printed them onto colored cardstock and laminated. My 4yo can trace with dry erase marker, put in alpha order, identify the letters, trace with play dough, cubes, pom-poms or any number of things. Tracing Bag – My 4 yo loves this bag! He can trace letters, numbers, his name or just doodle. This bag is great for car trips or doctors appointments as all the writing keeps him focused and quiet. I made his name page at Handwriting Worksheets. The small letter pages and ABC page came from Confessions of a Homeschooler. I printed the smaller pages at 2-per-page and made a flip book. 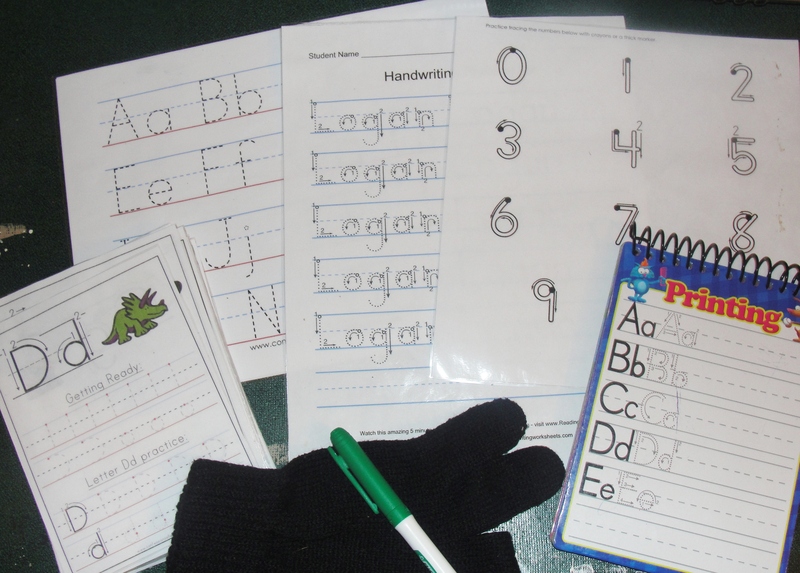 I got the dry erase book from The Dollar Tree and I added a dry erase marker and glove for an eraser. Visit All Our Days for more tracing activities and ideas. 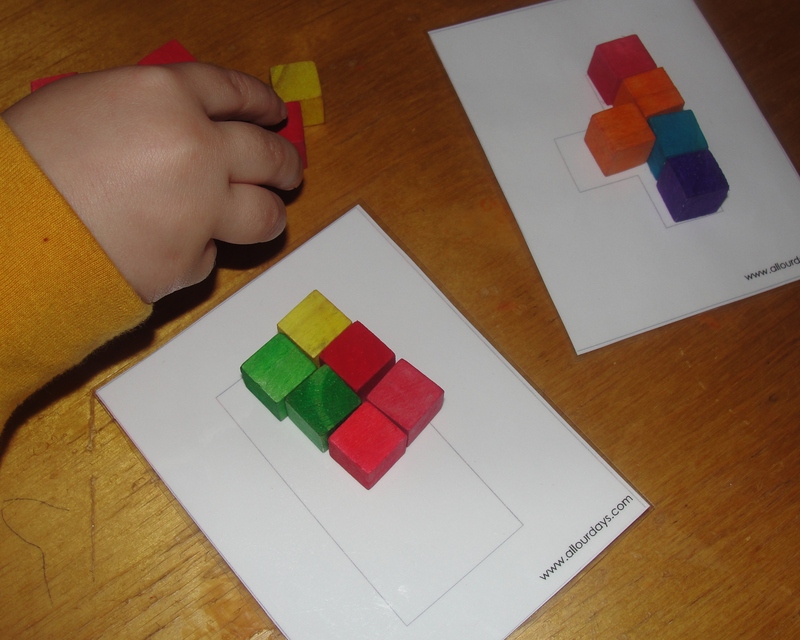 Cube Patterns – I got these printable from All Our Days and the blocks came from Staples dollar section. Both boys like this bag because there are so many things to do with it: fill in the patterns, stack them, sort by color, make shapes, count them…………. 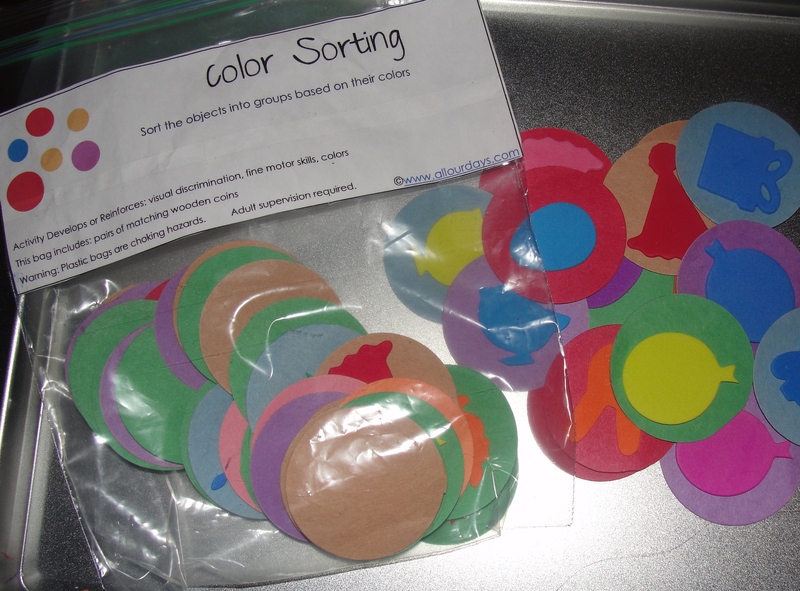 Color or Shape Sorting – I changed the contents of the bag a bit from the link. I already had circles cut from construction paper and foam shapes, so I just combined the two and made this bag. 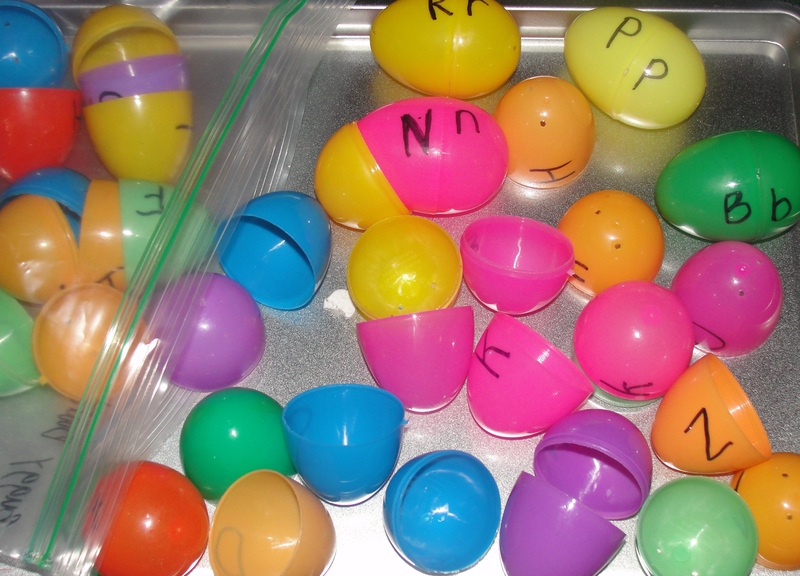 These can be sorted by color or shape or play memory match. 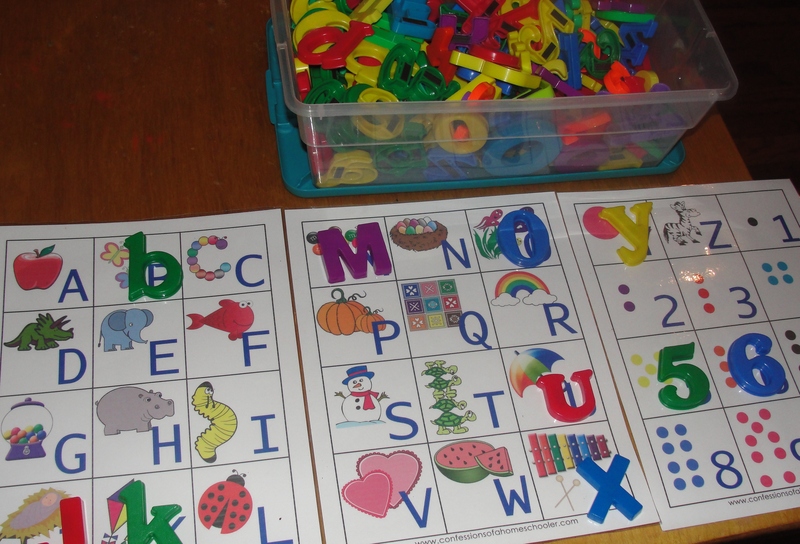 Alphabet Do-a-Dot Letters – I found these letter printables from Homeschool Creations. 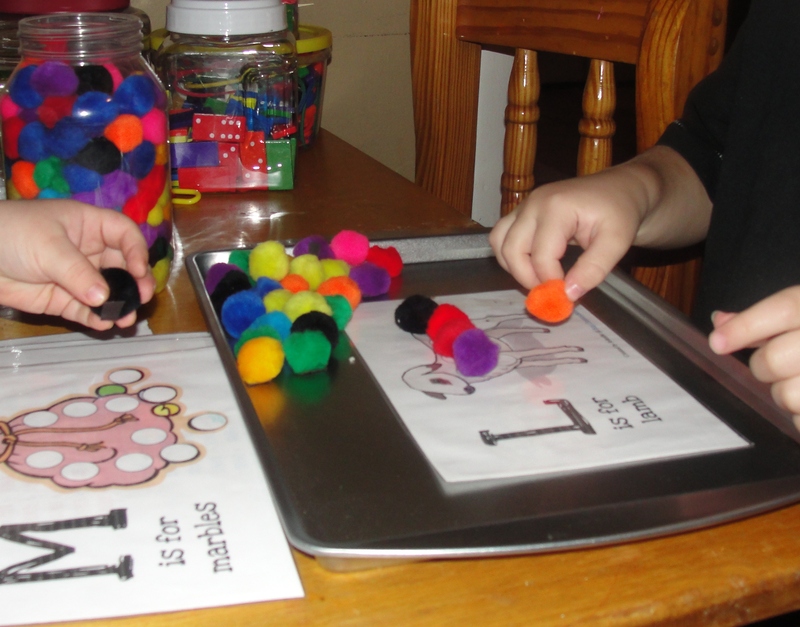 These can be used with dot markers or with magnetic pom-poms. 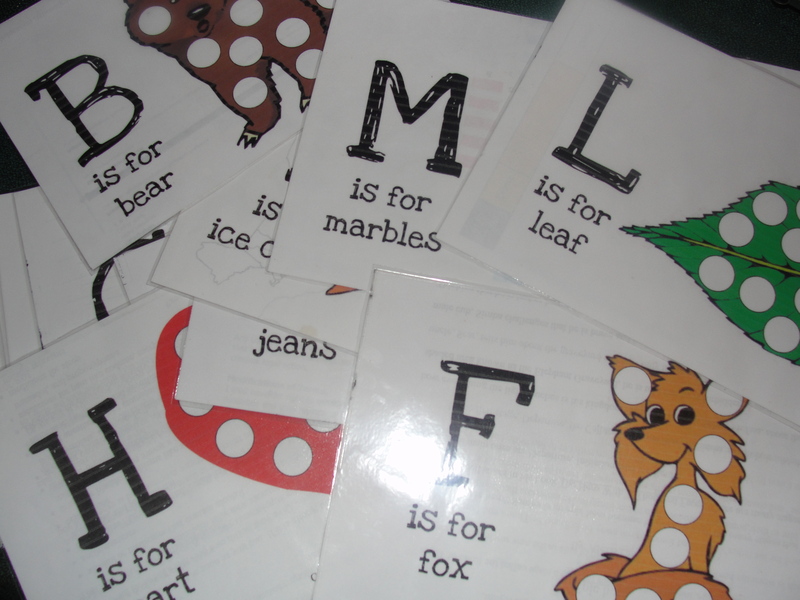 ABC’s Letter Match – These pages came from Confessions of a Homeschooler. I printed these to be placed side by side so all letters can be seen. There are a lot of things you can do with these cards. 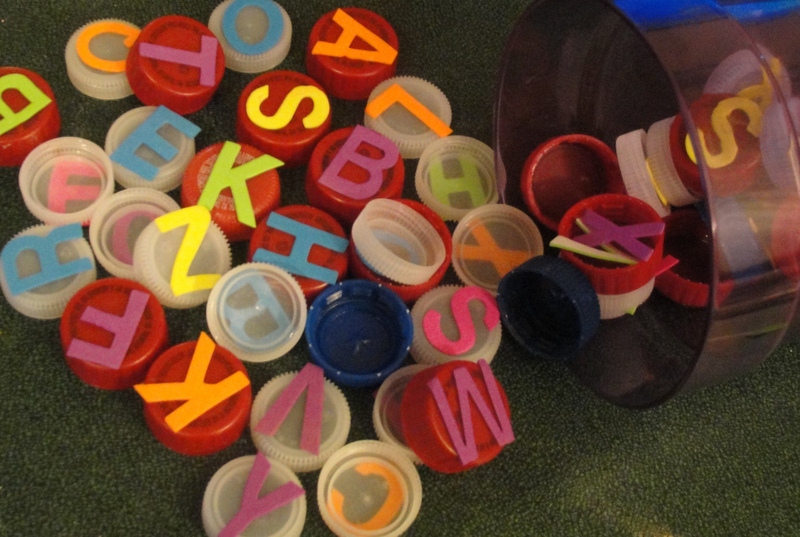 Match with lower case letters, match using magnetic letters, letter tiles, play dough, dry erase tracing. My 4yo finds the magnetic letter that matches the picture. He loves this and its colorful and cute. Hearts for Home Blog Hop. 100+ Geography Resources List of FREE Printables, Maps, Apps, Notebooking, Unit Studies, & More!